1840 Census* 1 Jun 1840� Elizabeth was listed as the head of a family on the 1840 Census on 1 Jun 1840 at Darlington District, South Carolina. Research note* 12 Jun 2004� Matthew Nathan was by himself in the 1850 census in Darlington District, SC, and was listed as age 30, born in NC. Around 1855 he moved to the Coleville area of Chickasaw Co., MS, and about that same time married Elizabeth F. Long, a native of NC. The 1860 census shows Matthew and Elizabeth with two children, James, aged two, and an unnamed three month old daughter. Also in the household were three older children, Wash, aged 12, born in NC, and George, aged 8, and Gaston, aged 5, both born in MS. These older children may have been visiting relatives, or may have been Matthew's children by a prior marriage. No futher record of them has been found. The only other Gaston Culpepper in the Culpepper family was John Gaston Culpepper, born 1822 in Anson Co, NC, son of Benjamin Culpepper (later of AR) and grandson of the Rev. John Culpepper of Anson, several times a U.S. Congressman. No record of Matthew's parentage has survived among his descendants. One grandson recalled, however, that Matthew had a sister, Sally, and a brother, James. From the 1850 and 1860 censuses, we know that Matthew was born in NC around 1820-1825, and may have lived there until at least 1848. We have no record of what county Matthew was from in NC. The names "Matthew" and "Nathan" were used in both the Culpepper and other families in Nash Co, NC, so he most likely was from Nash County. 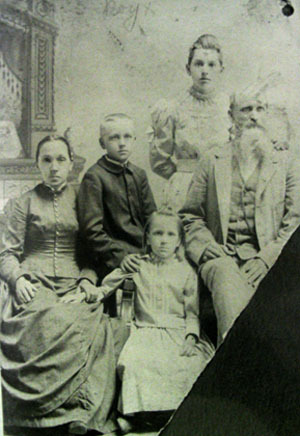 The only Culpeppers in Nash County in 1830 with sons born in the 1820's, if one can rely on the 1830 census, were William (William C. Culpepper) and Jeremiah (Jeremiah Culpepper Jr., of Jackson Co., TX). William's children are known, but Jeremiah Culpepper, Jr. could have been Matthew's father. The 1830 census shows Jeremiah with two sons born between 1820 and 1825, and the 1840 census shows two sons, one born 1820-1825, and one born 1825-1830. One of these two sons was almost certainly Alexander J. Culpepper. He and Jeremiah both show up in later censuses in Jackson Co, TX. The "J" in Alexander J. could stand for James, so that this could be the brother "James" that Matthew's grandson recalled. The sister Sally the family recalls remains unaccounted for. But the evidence directly supporting Matthew Nathan Culpepper as one of the two sons of Jeremiah Culpepper and Polly Vick is slim. 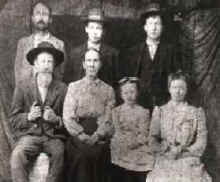 However, DNA testing of a descendant of Matthew proves that Matthew is a descendant of James Culpepper of Nash Co., NC. Note that Jeremiah Jr. is a grandson of James. DNA testing also rules out James Culpepper, Jr. (son of James Sr.) as a father or grandfather, as his descendants carry a unique DNA signature not found in Matthew's descendants. The name Matthew was used in the family of Henry Culpepper of Darlington, SC, James Jr.'s' brother. And James Jr. did have a son James H. Culpepper, and some daughters who are unaccounted for. So this would explain Matthew Nathan's grandsons' recollection that he had a brother James and a sister Sally. (b) the son of Jeremiah Culpepper, Jr., son of Jeremiah Sr., son of James Sr. It is this later possibility that we have favored in the construction of this family tree. 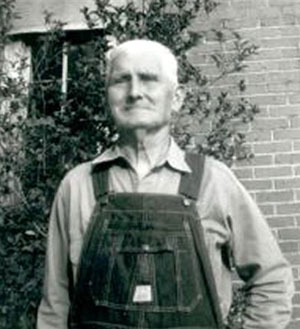 M. N. Culpepper, 30, M, Laborer, $--, NC. 1840 Census 1 Jun 1840� Alexander was probably a free white male, age 10 and under 15, in Jeremiah Culpepper Jr., of Jackson Co., TX's household, on the 1840 Census on 1 Jun 1840 at Nash Co., North Carolina. 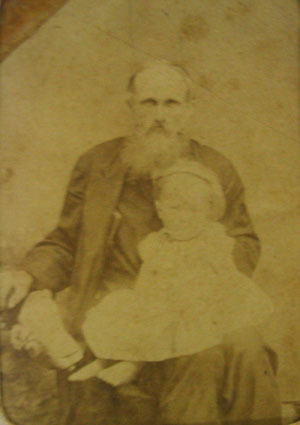 Jackson Co., TX: Alexander J. Culpepper and Sophia King, 28 Jan 1856. W. H. Whittington, 13, M,. L. F. Culpepper, 11, F, TX. Elizabeth F. Culpepper, Mother, Wh, F, May 1834, 66, Wid, ch 2/1, SC/SC/SC. 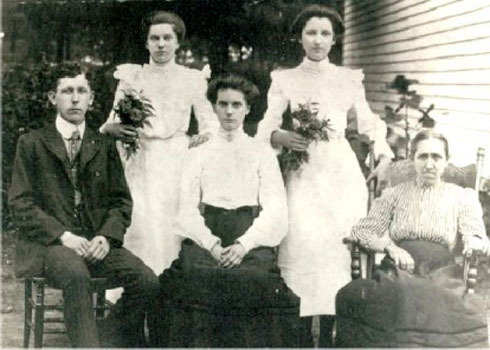 1st row (L-R): James David Culpepper, Sr; his wife- Mary Ann Ingram, and their daughters: Sally Floyd Culpepper and Mary Agnes Culpepper. James D. Culpepper, Jr. Age 27, Houlka, MS. Born 5 Jun 1890 in Houlka, MS. Farming for self at Houlka, MS. Father and mother are dependent on him. Single. White. Claims exemption from draft because he supports father and mother. /s/ James D. Culpepper, Jr. Medium height, medium build, blue eyes, light hair, not bald, and no disabilities. 5 Jun 1917, Houlka, Chickasaw Co., MS.
Sallie F. Culpeper, dau, F, Wh, 18, sng, MS/MS/AL farm laborer. E-mail written Mar 2001 to Coosa County AL Query Forum on GenConnect--Rootsweb from Mary Rush. "He had cut his leg badly while chopping wood. A few years later he had to have the leg removed and he died soon after. My grandmother never remarried. She and the two boys went to live with her parents where they lived until her mother died, then she went to live with her oldest son, my uncle, James William Culpepper. "My father and his brother had to be pretty self sufficient. E-mail written Jan 2007 to Warren Culpepper from Tammy G., e-mail address. Services for Mrs Mary Agnes Culpepper Gregory were held at 3 pm Monday in Shiloh Baptist Church, of which she was a member, with the Revs James W Henry and Ulvie Fitts officiating. Burial was in Halsell Cemetery with Browning Funeral Home in charge. She was 82. Mrs Gregory was fatally injured when a pickup truck in which she was a passenger ran off a road in the Toxish area Sunday evening and hit a tree. Her son-in-law and daughter, Mr and Mrs Bill Hester, and their seven children were in the truck and were carried to the hospital for treatment of injuries. PONTOTOC - James David Gregory, 83, died Tuesday, March 23, 2010, at his home. He worked for the county of Pontotoc for 37 years. He enjoyed hunting and fishing. Services will be at 2 p.m. today at Tutor Memorial Funeral Home Chapel with Bro. Greg Herndon officiating. Burial will be in Redland Cemetery. Tutor Memorial Funeral Home of Pontotoc is in charge of arrangements. Survivors include his wife, Marie Gregory; one son, Thomas "Tommy" Gregory and his wife, Brenda; three grandsons, Bryan (Kim), Bradley and Michael Gregory; two great-grandchildren, Brady and Susie Gregory; and one sister, Lucille Hester. He was preceded in death by his parents, Tom and Mary Agnes Gregory; one sister, Annie Mae Collums; and three brothers, Oscar Lee Gregory, Willie Gregory and Little Roy. name as listed in Culpepper family Bible. Penelope M. Culpepper, 21 Sept 1868 - 29 Jan 1888. Bernice Tison Culpepper Ford, 22 Aug 1876 - 20 Sept 1916. Ada Culpepper, Wife, Wh, F, May 1881, 19, md-1yr, AL/AL/AL.